The first ever world championship in ice swimming was held in the Russian Arctic Circle on March 20-22. RIR talked to some of the participants in Murmansk about overcoming their limits and asked them whether sports can help resolve political differences. 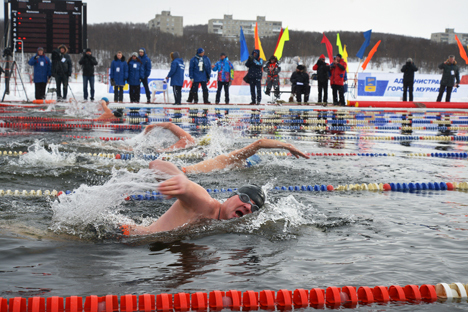 The Russian Arctic city of Murmansk has become the maiden host of the first ever world championship in ice swimming and Russia’s 10th open winter swimming championship. Around 500 athletes from 22 countries took place in the two events on March 20-22. Fifty athletes from 15 countries competed in the 1,000-meter swimming event at the world championship. Applications for participation were four times as many, but not all swimmers were able to qualify. Under the rules of ice swimming, only those athletes who can cover 1,000 meters in under 25 minutes are admitted to compete at this distance. But the championship of Russia was open to all-comers. A 25-meter ice pool on an ice-bound lake was prepared for the athletes. The weather had been warm in Murmansk during the last few weeks, so the spectator stands were placed on the shore for the sake of security. But by race day the weather was severe as it should be in the north. The water temperature did not exceed one degree above zero, and at times the city was wrapped in a snowstorm. The women were the first to start. Not all participants managed to swim the required 1,000 meters; some left the ice pool early. Seventeen-year-old Renata Novakova of the Czech Republic came in first and set a world record as she did, having covered the kilometer-long distance in 14 minutes 21.82 seconds. In the men’s event, it was Christof Wandratsch from Germany who emerged triumphant to become the first world champion. Wandratsch swam the distance of 1 km in 13 minutes 0.52 seconds and broke the world record, which he established himself last year. "I am very happy that I have become the first champion of the world," Wandratsch said after his record-breaking performance. "The championship was organized perfectly, the opening and closing ceremonies were excellent, and the security system for athletes was well thought-out." It was not Wandratsch’s first visit to the Arctic city: Last summer, the German took part in the Murmansk Mile festival, where he won a swimming race across the Kola Bay with a record time. The winner was determined not only in the overall classification, but also in different age groups. An athlete from the UK, Katherine Fryatt, won the event for women of 45-49. An employee of the Hampshire County Council, she plunged into the icy water without fear. "I experienced a great feeling during the race," said Fryatt, who explained that she swims in lakes at home in England. “Everybody was very friendly here. This is my first time in Murmansk, but I definitely want to come back." Frenchman Alexander Fuzeau has been keen on swimming since his childhood and also has experience in running and triathlon. He first tried his hand at ice swimming a few months ago. Asked about the relationship between sports and politics, Fuzeau said that he saw no evidence of the current standoff between Russia and the West in relations between the participants and hosts of the competition. “I did not feel any political confrontation between Europe and Russia here. I believe that we should not build walls between the countries," said Fuzeau. U.S. swimmer Craig Lenning has never swum in such cold water as he did in Murmansk, but it did not prevent him from taking second place in his age group of 35-39 years. "It was a wonderful event," Lenning said. "The relations between the U.S. and Russia are tense now, but it is people who love sports who gathered here. Sanctions are not an obstacle for us." Melissa O’Reilly, who won in the 30-34 age group, agreed with her compatriot. "The local spectators were very supportive of swimmers," O'Reilly said. "They do not care who is in the water, Russians or foreigners." "We felt the support of the audience," added another American, Jamie Monahan, the winner in the 35-39 age group. "They gave us energy to fight – they shouted, clapped, sang songs and even danced."